A dejected Kevin Walsh after the loss to Dublin. 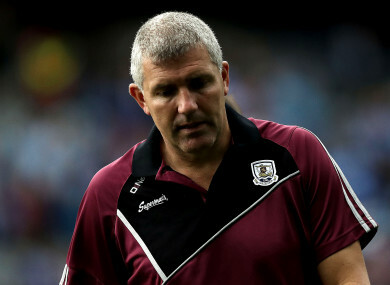 SATURDAY NIGHT DREW a line under Galway’s 2018 football involvement and brought a close to a fourth year at the helm for their main man. Kevin Walsh has held the managerial reins out west since the commencement of the 2015 season. Progress has been incremental – a round 4 exit in this first season, a pair of quarter-final losses and then this semi-final reversal at the hands of Dublin. In the Galway camp there is a push for him to remain in that position when the 2019 campaign kicks into gear. “I think it’s very important that he does stay on,” remarked experienced defender Gary O’Donnell afterwards. “He has four years done and I think any of the top managers – Eamonn Fitzmaurice in Kerry had six, Jim Gavin in Dublin has six years. Speaking after Saturday’s game, Walsh was not making any pronouncements on his future and instead wanted to reflect. “Ah, to be honest, I’m not considering anything. I’m only a half an hour after getting bet. It’s not as simple as Kevin or any one person. “There’s a backroom here of around 20 people, but things change – players change, management change, circumstances change – I just haven’t had time to reflect on that to be honest. I certainly will be reflecting on the year in my own time. “I don’t know if we’ll be here next year. It’s a case of Galway closing the gap. It’s important that we are closing the gap on every other team as well, not Dublin, that we’re getting better. “Time will tell, but it’s a young team in there but if they really want to put their shoulder to the wheel and do the extra bits required to catch up to Dublin, that’s the questions that they’ll have to ask themselves and that applies to management and everyone else – the county board – we have to push the boat out here to catch up with a team like Dublin. O’Donnell feels their side have the capacity to improve. “We probably feel on reflection on that game that there is still probably a bit more in us. On reflection of the year, we ticked a lot of the boxes that we set out to at the start of the year, even though a lot of people might not think that. “We had broken a few records that we hadn’t done before, we got to our first All-Ireland semi-final since 2001 and against one of the best teams of the modern era. We probably weren’t given a chance coming up here even by some of our own supporters. “We have a young team, I think our average age is only 24 and a lot of lads are coming through and there’s progress being made, so it’s not all doom and gloom as well. “Any of the boys that came into the squad had an immediate impact and they really freshened things up. Competition for places was greater than it’s every been, they hit the ground running and added a real impetus. Email “'Kevin has built us and got us to where we are' - Galway call for manager to stay on”. Feedback on “'Kevin has built us and got us to where we are' - Galway call for manager to stay on”.